Congratulations! You’ve successfully removed the old, ugly and dated tiles. And if you read my previous entry, you did it without damaging the drywall ;). So now in a perfect world, you’re ready to start tiling. Well, not so fast. Drywall is so delicate. You’re bound to be left with cracks and holes (divots) after removing the old tile. 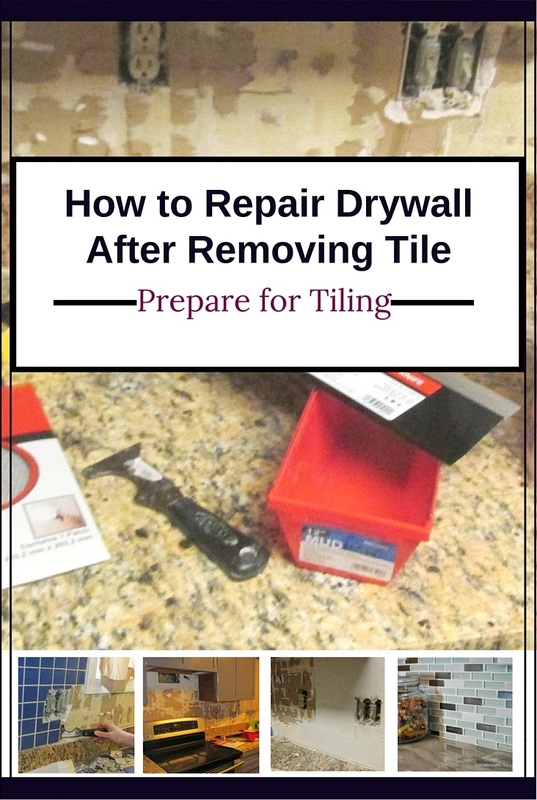 So while you don’t have to reinstall new drywall, before you’re able to apply the new tile, you first have to prep the wall for the new application. Start by removing any excess adhesive from the wall. This can be done with a scraper. For additional strength use an adhesive remover. Brush away any dust and fallen tile residue/debris. 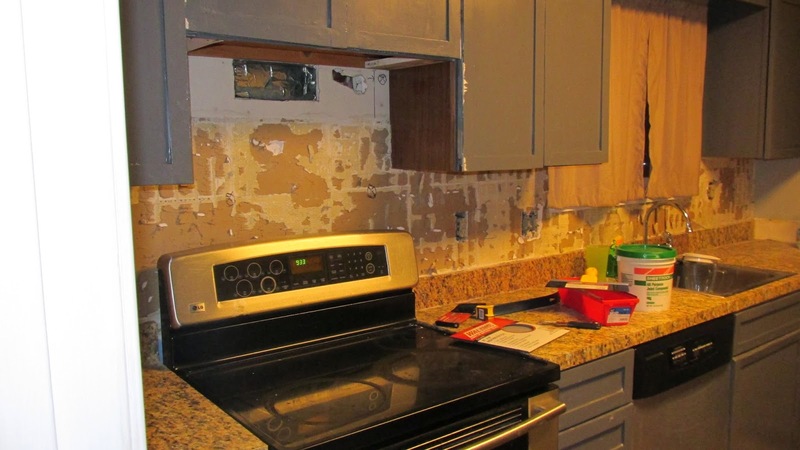 Now if your kitchen is anything like my kitchen, once I removed the old tile I found issues in the original drywall that required my immediate attention before I was able to fill any cracks or holes in the wall. There were actual holes in the drywall under the previous tile that the previous owner (original tile installer) covered up with merely tiles. I had to first patch the holes in the wall in order to have a secure backing for my new tile. Luckily none of the holes were large enough that it required me to buy drywall to patch up the holes. Instead I was able to use a Drywall Repair Self Adhesive Wall Patch. Allow time for the joint compound/Spackle to dry in accordance with the instructions found on the packaging. A second coat may be required of compound. Once the Joint Compound is dry (usually 24 hours) sand the rough spots using drywall sanding sponge or drywall sanding paper. Wear a mask and googles during this process. Also ensure adequate ventilation by opening a window. The link ‘Next:Installing a Tile Back splash’ does not connect or link to another site to show how the new tile goes on after the old tile is removed. I now have a naked back splash wall that has some drywall face paper/glue spots and some bare drywall. Will the glue for the new tile adhere to the bare drywall?? Or you can use a tile mat like this MusselBound 15-sq ft 0.031-in White Plastic Commercial/Residential Tile Membrane. http://www.lowes.com/pd_555605-65158-555605-W_0__?productId=50141955. I used the tile adhesive because, even though it’s a little messy its cheaper and I feel it ensures a good bond. But I may use the mat in another upcoming project. But you know what? Thank you! You motivated me to get the tile installation post up. Thanks for the reply and good luck on completing the site. Oh Man I’m sorry to hear that. Yes, the neater the application, the easier the sanding phase. Don’t beat yourself up about it though. There is an art to drywall installation that very few have mastered. I’ve made mistakes in the past. You want to apply 3 to 4 thin/smooth coats for complete coverage of the drywall tape. Allow the coats to dry in between applications. Also don’t forget to wear a dust mask during the sanding process. The drywall dust is very hazardous. I wish you the best of luck this weekend. I know you can do it. Feel free to message me if you have any questions. Hi Linda! That actually is the quickest part of the tiling and retiling process. It took me about an hr or so. It popped off relatively quickly once I got started. Also there were some areas where the old tile didn’t fully adhere to the wall. Can you use the same method in a tub surround with cement board? What would I use in place of dry wall compound on the cement board? With a tub and shower I recommend replacing the cement board because chances are when the wall was originally tiled the requirements and products available were very different. 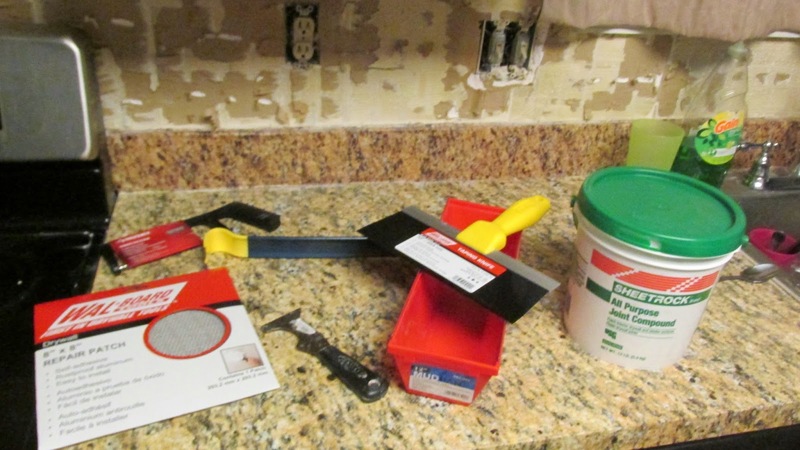 I’d like to recommend using BONDERA ( http://www.Bondera.com ) for such projects – a double-sided peel-back adhesive matte that sticks on the wall and has a 1/4″ grid on the front to keep you plumb, level and square – no overnight dry-time, so you’re ready to grout and be DONE! Huge time and cost savings overall. Using Bondera, I successfully and beautifully put up the tile backsplash in my kitchen six years ago but now want to change tile. Is it possible to simply remove the old tiles and then brush off any mortar that may have pushed through the tiles and onto the Bondera? Or do I have to remove the old Bondera too? Please help. Hey Marty You can remove the tile and scrap away the excess mortar. But you may have to repair any scratched or damaged drywall with joint compound. You also want to make sure the application and finished wall is as smooth as possible before reapplying the new tile. For areas that are too badly damaged, I would cut out the drywall and patch it up with a new piece of drywall. I would remove the old Bondera. It’s not meant for reapplication.